Dozens of protesters are refusing to vacate a property on North Frederick St in Dublin city centre despite a High Court injunction ordering them to leave by 2pm today. Activists from a number of homeless groups have been occupying the house over the last week in response to Ireland’s housing crisis. People Before Profit TDs Paul Murphy and Richard Boyd Barrett were in attendance, with Mr Murphy saying the resistance could become the "next Apollo House". Yesterday, Mr Justice Michael Quinn granted Patricia Ní Greil, the owner of 34 North Frederick Street, Dublin 1, injunctions requiring persons unknown to vacate and cease trespassing at the four-storey building. Activists responded by organising a protest for 1.30pm today and are refusing to leave the premises. "This is going to be a long day, we’re not going anywhere," a spokesperson for Dublin Central Housing Action said. Protesters have been shouting chants of "Murphy, Murphy, Murphy, out, out, out" and are wearing masks of Taoiseach Leo Varadkar and Housing Minister Eoghan Murphy. A bag of pellets connected to a firework was thrown at the group of protesters. Nobody was injured in the incident and it is not known who threw the firework. A small number of gardaí are at the scene, but neither the landlord or security personnel have yet shown up, despite the 2pm deadline passing. 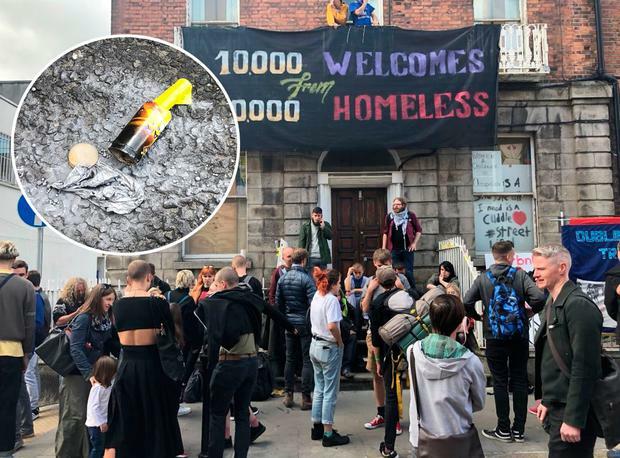 Last week, protesters attended Leinster House in an attempt to meet with Housing Minister Eoghan Murphy over the number of vacant properties currently lying idle across Dublin. A spokesperson for Minister Murphy said they attempted to meet with the activists last week but they failed to show. "We agreed to meet the group last Thursday - we had a number of meetings in Leinster House that day. "The group agreed to meet in Leinster House. The refused to provided a list of names for the ushers on the gate and didn’t show up to the meeting scheduled for 3pm." This is the second occupation of its kind this month, as the same group of activists took over a property in Dublin’s Summerhill Parade in early August. Up to 120 tenants were evicted with only 48 hours notice due to "fire safety reasons" from a number of houses on Summerhill Parade in May. The properties are owned by Pat O'Donnell & Co Ltd Retirement and Death Benefit Plan, the trustees of which are PJ O'Donnell and Peter McLornan, who were granted a High Court injunction to have the property vacated two weeks ago. Organisers of the protest today say they want: "To continue to highlight the causes of this housing crisis, one of which is land hoarding and speculation by private owners."